When you wake up in a room full of books it is like opening your eyes to a buffet of adventures, of places to explore and of lives to peer into. When I open a book that has been read before perhaps by a stranger , I dwell on the idea that the book I am holding bears at least one more story in addition to the one written on its pages. I get curious on how the book might have affected its previous reader and what does the it hold for me. My fondness for pre-loved books lures me towards thrift bookstores. The old smell and the yellowed dog eared pages fascinates me so much that I feel a momentary serenity when I enter any house of books. The pull of La Belle Aurore was too strong to ignore. 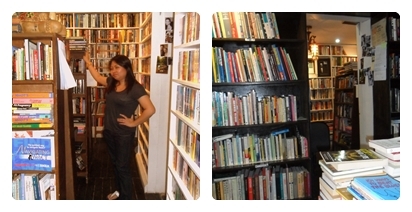 After months of knowing this enticing nook exists, me and my bookworm friends finally just stormed in and literally raided the place! It was like Disneyland, we wanted EVERYTHING! I found so many titles there that tickles my fancy and I could only wish I had the resources to put them all in my plastic bag! It was so hard choosing the books to bring home! 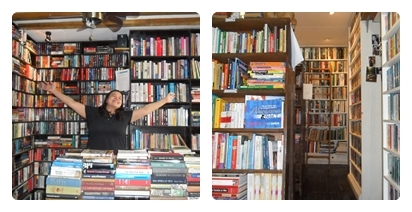 I don't know if there are other thrift bookstores as homey and cozy as La Belle Aurore here in Cebu City. Unfortunately, Booksale, to me, lacks the ambiance of a personalized bookshop although they serve their purpose of offering second hand books. 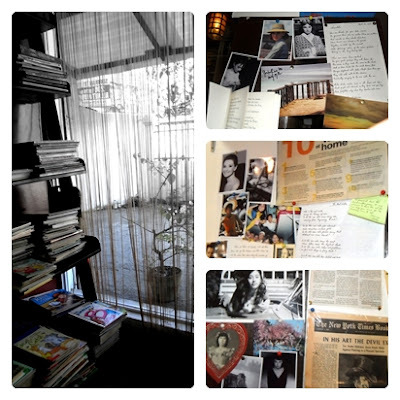 I love the vintage feel and Audrey Hepburn's presence here! It's the eccentricities of bookshops like La Belle Aurore that set the tone for a reading that seeps deep into the soul. Waking up to a room full of books is like a beautiful sunrise that inspires us to bask in the endless possibilities of life while it unfolds upon us every waking day!